Neutrogena Mineral Sheers Powder Foundation: I have dark under-eye circles naturally, so I use a couple of products to combat them. This Neutrogena powder is my absolute favorite thing to set my under-eye concealer or to wear by itself. It matches my skin perfectly and doesn’t make face look powdery or cake-y! MAC Lipstick: What girl doesn’t love a good MAC lipstick? Although I haven’t bought one in a while, I don’t mind spending the money on them because of the good quality and pretty colors, (not to mention the awesome help you receive when going to a MAC counter). 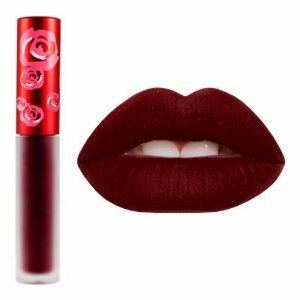 Limecrime Velvetines: Right up there with the MAC lipsticks, Limecrime has great lip products that last for a really long time. I love the Velvetines in particular because it gives a great matte finish without drying your lips out. My personal favorite is the color Wicked! Large Size Makeup Removal Wipes: This isn’t really a splurge item, but when I go to the drugstore, I make sure to buy the largest size of makeup removal wipes they have, usually in the brand Say Yes to Cucumber. I can’t stand going to sleep with makeup on (especially mascara) so I make sure to buy a huge pack of these every time I run out. Kat Von D Tattoo Concealer: I can’t believe I paid $22 for some concealer, but when the associate at Sephora let me sample this, I was sold. It’s by far the best concealer I’ve ever tried, great for under-eye circles and defining your eyebrows. I only use it when I want to look super put together, but this will definitely be a staple in my makeup collection. 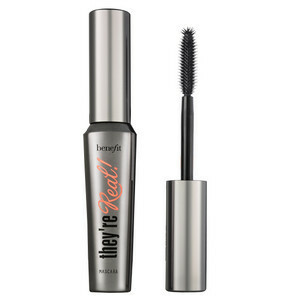 Benefit They’re Real: Believe the hype when it comes to this mascara. The absolute best mascara on the market. This mascara not only makes your lashes look super long, but they also make them super dark without giving you spider lashes. Just like the Kat Von D concealer, I only use benefit when I want to look super put together, maybe while on a date or going out with my girls, but if you are on the hunt for a mascara that provides volume and length, this one is worth every penny. Beauty Blender: I never thought I would fall for the beauty blender trap, but they really do get the job done. I have two of the mini ones, perfect for dabbing under eye concealer and defining my eyebrows. I always had trouble setting my concealer with brushes and was a little skeptical about investing in a beauty blender at first, but it was worth it. If you’re someone who has trouble setting concealer around the brows, I would definitely suggest a mini beauty blender! What beauty items do you splurge on, don’t be ashamed! I think it’s better to splurge on key items than a whole bunch of less expensive products that don’t work. Tell me what you splurge on in the comments section and don’t forget to follow me on instagram @IndiaWrites or YouTube @indiaVlogshair! Next post What Drives Your Discipline?